Turning now to the lectures themselves, we begin with an overview of the first three of six, which lay the foundation work of Chalmers’ thought on the warrant and function of a religious establishment. In Lecture 1, he defines an establishment and removes some typical prejudices that in his day prevented some from giving it serious consideration. In Lectures 2 and 3, he counters and refutes the two 19th century rivals of establishmentarianism, namely, the liberal ‘free trade’ economists and the Voluntaries, and in so doing vindicates the questioned institution. With this roadmap before us, we turn our attention to Lecture 1. Chalmers recognizes at the outset that there is a “felt indisposition” on the part of many to religious establishments (9). It seems as though this reliance upon the “machinery” of an establishment betrays a mistrust of simple dependence upon heaven for spiritual blessings. But this over-pious mindset fails to appreciate the harmony between divine activity and human responsibility. One only has to observe the analogy between human cultivation of the soil and the churchly cultivation of the soul. If in the former sphere, there is nothing inappropriate with intelligent, vigorous endeavors to improve the land and a trust in the God who alone controls the weather and the elements, then there is nothing inappropriate with “spiritual husbandry” (11). The part which God takes in the operation, does not abrogate the part which man ought to take in it. They are the overflowings of the Nile which have given rise to the irrigations of an artificial husbandry in Egypt, for the distribution of its waters. And there is positively nothing in the doctrine of a sanctifying or fertilizing grace from heaven above, which should discharge us – but the contrary – from what may be termed the irrigations of a spiritual husbandry in the world beneath. It is not enough that there be a descent; there must be a distribution also, or ducts of conveyance, which, by places of worship and through parishes, might carry the blessings of this divine nourishment to all the houses and families of a land (12-13). This being said, he certainly does concede that such an economy of spiritual distribution cannot save in and of itself. If you build it, they will not necessarily come. “Its channels of distribution, however skillfully drawn, will, if dry and deserted of Heaven, convey nothing for human souls; and the goodly apparatus of a strong and thick-set Establishment in the land will neither prevent nor alleviate the curse of its spiritual barrenness” (14). Yet, it is a firm principle of Scripture that God employs humble means to usher in His salvation to this world of sinners. He uses the reading and the preaching of the Word. He uses men, ordained and sent by the Church. “God gives the increase,” to be sure. But He also does so by the “planting” and “watering” of Paul and Apollos, whom He calls as His “fellow laborers” (1 Cor. 3:5-10). With this in the back of our minds, the question that next confronts us, says Chalmers, is what is the best expedient, the most efficient economy of distribution for ensuring that the blessings of the Gospel will be conveyed to every creature under heaven (Mk. 16:15)? He will be contending in the following lectures that it is a religious establishment that suits the purpose. Now, what is a religious establishment? In short, it is “a sure legal provision for the expense of [the] ministrations” of the Church within a nation (17). There may be other nonessential elements that are frequently considered in establishments; but this is the core, the essential nature of an establishment according to Chalmers. This sure legal provision for the maintenance of the established Church does not imply, however, any further connection. The Church, when patronized by the state, is independent from the state in all things spiritual. “For their food and their raiment, and their sacred or even private edifices, they may be indebted to the state; but their creed, and their discipline, and their ritual, and their articles of faith, and their formularies, whether of doctrine or of devotion, may be altogether their own” (20). Chalmers is heading an objection off at the pass here. Those who oppose religious establishments contend that the Church, by receiving state endowment, thus becomes enslaved to an earthly master, and so morphs into mere department within Caesar’s bureaucracy. The Church is then domesticated and enslaved to the ‘hand that feeds her.’ Yet, says Chalmers, this is not necessarily the case. When, for example, a merchant chooses to hire and support a missionary in his West India plantation, the missionary does not necessarily become a spiritual vassal of his financier. His stipend is from men, but His orders are not. This missionary takes the endowment as a blessing from heaven and labors to bring the good news to that district where the hand of Providence has led and provided. If this little model on a small plantation in the West Indies is acceptable, why may it not on a far greater scale? Ah, but there is the testimony of history. Didn’t Constantine’s adoption of Christianity as the state religion mark the spiritual downfall of the Church? Is it not here that Mystery Babylon had its birth? Chalmers responds that the causes of the spiritual downgrade had begun before Constantine. The misfortune of the Edict of Milan lay in “the ascendancy wherewith the [pre-existing] superstition and ignorance both of princes and people had vested the ecclesiastical power, of which it most unworthily availed itself, to its own enormous aggrandizement in things temporal – at once supplanting the rightful authority of God in His Scriptures; and substituting both a doctrine and discipline of its own, by which to blind the souls of men and subjugate them to its sway” (24). And if the opponents of the establishment, he writes, want to enlist history, what of the Reformers? 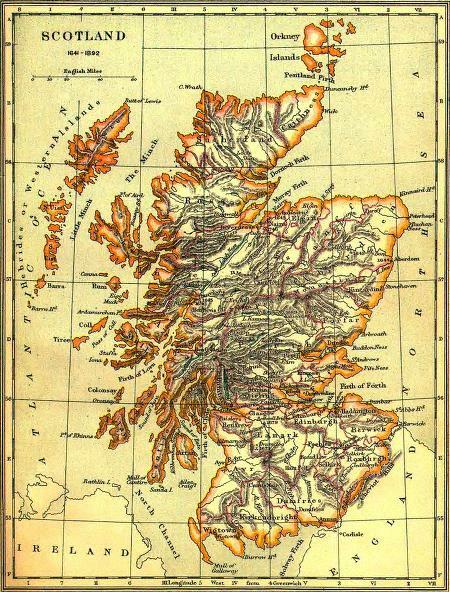 They, as their heirs in the 19th century, yearned for the Christianization of Scotland. John Knox cried to heaven, ‘Give me Scotland, or I die!’ Now, did this mean for Knox and company demolishing the old machine, with its universities and parishes, handed to them by Medieval Christendom? No. “They did not, with blind and headlong zeal, demolish the old apparatus of distribution. They substituted the true gospel for a false one; and sent forth its now amended and purified lessons along the old pathways of conveyance” (26). In short, they distinguished between a good expedient, tried and proven, and its bad operators. For the Reformers, they kept the business intact, but changed the management – and with good effect, we might add. And so, Christians ought not to be so hasty to scrap the means that could be effectively employed for Christianizing the masses merely because it has been misused. “Were the water of London to take on a deleterious tinge from the accession of some impurity – the way surely is to purge it of this, or, if possible, to bar the ingress of it, rather than make insensate attacks on the subterranean machinery, by which distribution is made of it through the streets of the city and into the houses of the citizens” (34). Having thus dealt with removing initial prejudices to the question, Chalmers turns to the positive argument for religious establishments in Lectures 2 and 3. To appreciate the warrants for a religious establishment, one must see how it stands opposed to the system of free trade in commerce. The liberal economists of the 19th century, following Adam Smith’s doctrine laid down in his Wealth of Nations, argued that the greatest good would accrue to society by the free and uninhibited trade of goods and services, by allowing the simple laws of supply and demand to prevail. Government should not intervene, for whatever motives. This will only disrupt things and inhibit the greatest good for all. Adam Smith himself applied these principles to Christianity as a good in society. It ought to be left unregulated by government interference and “limited to the extent of the market” demand (48). However, says Chalmers, Christianity must necessarily fail as a good in society on this plan. A free trade in commerce, only seeks to those places where it can make out a gainful trade; but it is sure to avoid or to abandon those places, where, whether from the languor of the demand or the poverty of the inhabitants, it would be exposed to a losing trade. By a free trade in Christianity, let the lessons of the gospel follow the same law of movement; and these lessons will cease to be taught in every place, where there is either not enough of liking for the thing, or not enough of money for the purchase of it: Or that religion, the great and primary characteristic of which was that it should be preached unto the poor, must be withheld from those people, who are unable by poverty to provide maintenance for its teachers (49). This reality accords with the historical facts of the Christian movement prior to its establishment in the Roman Empire. Christianity was not a naturally attractive commodity. Consequently, missionaries went out, thrust forth into a world that had no pre-existing taste for the teachings of Jesus of Nazareth. And at whose expense did the pagans receive this doctrine of heaven? Who paid (or housed and fed) the laborers who were worthy of their wages? It was not the beneficiaries: at least not initially. Christianity was heavily subsidized in its movement throughout the Mediterranean world and beyond, through a nameless host of private benefactors. And sometimes, the laborers even paid themselves in order to preach without fees (Acts 20:34, 2 Thess. 3:8)! Non-establishment missionaries in Chalmers’ day certainly acknowledged that Christianity could only be introduced into a new territory by the underwriting of others. Their home and foreign mission societies were proof of this: the pagans would not pay for what they needed most! Now, one could plausibly counter that once missionaries are introduced to a foreign country and find some success that a “native demand will be set agoing” (68), sufficient to maintain the ministry without subsidy. Yet this will not obviate the need to press still further in the cause of the Gospel in that land. And that is precisely the raison d’être of an establishment. It is not the whole that need a physician, as it were, but the sick. Further, the dissenting chapels of Chalmers’ day, though unendowed by the state, did not strictly operate by the laws of free trade. The plain facts are that these churches had from time to time run into needs that those with deeper pockets, either within their congregations or associations, benevolently supplied. “Unlike to the other articles which are brought into a market, and of which the supply is continued only because of an adequately returning price – unlike to these, the returns for the article of Christian instruction are very often beneath the prime cost incurred in the preparation of it” (66). As long as there are lost souls to be reclaimed in this world, the Christian enterprise will require subsidy. Let [there] be a church, for distribution amongst [these unevangelized poor] of the bread of life, or for the supply of their moral and religious wants: and its presence in the midst of them, with the weekly invitations of its Sabbath-bell, will fail to attract beyond the veriest handful of the surrounding population to this house of prayer – and, more especially, if the market-price for the accommodation and the service be expected at their hands. It may or it may not be filled to an overflow by hearers from all distances, who have both the wealth and the will to pay for their attendance. But hundreds often are the families in the precincts of this temple of piety, so near that the voice of its psalms may enter their dwellings, yet not awaken them from the insensibility of their spiritual death (72-73). Let the rules of unregulated commerce apply, and this population will perish for lack of knowledge. Finally, in a flourish of righteous passion, Chalmers exposes and excoriates the “cold and secular utilitarianism” behind this imposition of free trade on Christianity. To draw a close analogy between articles of commerce in this world with the grand article of salvation, and with all the moral, intellectual, and social blessings that it entails, is crude at best and heartless at worst. What measure is there between profit and human worth and dignity? Between gaining this world and losing the soul? Further, Chalmers states positively, “after all, there is not only false sentiment but even false arithmetic in the views of these gross mercantile calculators. The universal scholarship for which we are contending, would, if carried into effect, be indeed the cheapest defense of our nation – whether its expenses shall be defrayed in the form of a liberality by the hands of private individuals, or from the public treasury in the form of an endowment” (75). Clearly, there is no ultimate concord between Christianity and commerce. But is there another model to put in its place, other than the old establishment? Consequently, Chalmers turns in his third lecture to deal with the argument of the Voluntaries to confirm his thesis. To begin, many confuse liberal economic principles as applied to Christianity with the system of Voluntaryism, which is simply the evangelical contention that the Church should have no connection with the state, financial or otherwise. Chalmers distinguishes between the things that differ. There is within Christianity two types of voluntaryism: internal and external. Internal voluntaryism is the willing financing of the ministry by the people directly benefiting from that ministry. Concretely, this could be a local church membership committing to pay its minister entirely from its own resources. No one is coerced, for they are all quite willing. And no money is taken from other sources, much less the state. This is a commendable scheme, and, incidentally, fits quite nicely with the economic dogmas of Adam Smith. The beneficiaries pay for the benefits, and so supply meets demand. External voluntaryism, on the other hand, is the giving or receiving of financing from other quarters due to monetary shortfalls within struggling churches and ministries. In external voluntaryism, benefactors willingly contribute to the Christian instruction not of themselves but of others who either cannot or (in the case of the unconverted) will not pay. Missions, foreign or domestic, operate on this version of voluntaryism. Here, it becomes clear that the Voluntaries are not free traders, pure and simple. They finance struggling churches and ministers and underwrite the cost of sending missionaries to the pagans. They, therefore, are external voluntaries, and seriously interfere with the free trade of the commodity of Christian instruction. They subsidize it, “repairing the deficiencies of the market price” (85), and so violate liberal economics. Free trade in Christianity and Voluntaryism must not be confused. To replace the establishment with Voluntaryism, then, throws us back to another question. We are all agreed, says Chalmers, Churchmen and Dissenters alike, that internal voluntaryism is insufficient to extend the Gospel where it cannot or will not be financed. “We presume it to be agreed on both sides, that the outcast millions ought to be reclaimed from the ignorance and irreligion of heathenism. The only difference relates to the party at whose expense this great achievement ought to be perfected – whether by private Christians, under the impulse of religious benevolence; or by an enlightened government, under the impulse of a paternal regard for the highest weal of its subject population” (87, emphasis mine). The Voluntaries obvious argued for the former, Chalmers and company for the latter. “We, the advocates of a National Establishment, hold it the duty and wisdom of every state, thus to undertake for the education of the great family under its charge, and to provide the requisite funds for the fulfillment of the enterprise – and this without prejudice, but the contrary, to the liberality of those individuals, who might choose of their own means to build more churches, and maintain more ministers – thus adding to the amount of Christian instruction in the land” (87). When the Voluntaries plead that the establishment should be abolished, Chalmers merely raises the question, with what success have they showed to warrant the scrapping of the old engine for Christianizing the masses? Have they prevailed upon the mushrooming numbers of unchurched in Glasgow or Edinburgh? The numbers do not look promising, he observes. The establishment may be an expedient in Chalmers’ mind. But it is a tried and tested one. It should also be further asked, why the objection to state-funded Christian education (i.e., the teaching and preaching of the Gospel) of the citizens, when state-funded ‘secular’ education is accepted? Why should the fathers of a commonwealth provide temporal education for their children and on principle (!) withhold spiritual education? And whence this ‘enlightened indifference’ to religious matters in the state? Is it of heaven or of men? Those who vociferously argue against establishments have imbibed an unbiblical philosophy that presumes that government should be “lifeless to all … things sacred” (93). Those in power, “maintaining a calm and philosophic indifference to all the modes and varieties of religious belief, should refuse to entertain the question, in which of these varieties the people ought to be trained” (93). But would God have those in office indifferent to His will and ways, as though their position granted them an ethical immunity? Further, this enlightened detachment about religion doesn’t even agree with the very human character of the state. “The corporation of a state cannot be … denaturalized, or reduced to a sort of caput mortuum, discharged of all soul and sentiment – as if by a process of constitution-making in the crucibles of a laboratory. The cold metaphysical abstraction that is thereby engendered, may exist in the region of the ideal; but it does not exist in the region of the actual, nor even in the region of the possible” (94). Legislators and governors also have feelings for other issues that concern the good of the commonwealth. Can they be altogether detached on that which most affects the good of those under their care? Would they not wish to patronize, even as a matter of policy, the Christian cause, if it yields “an incalculable saving of the wealth, and still more a saving to the happiness of the nation … [by] the prevention of crime rather than its punishment” (97)? Then, picking up a thread he had left earlier, Chalmers points out how one branch of the Voluntary principle – external voluntaryism – can actually complement the function of an establishment. Private philanthropy can induce public philanthropy. In fact, “we behold in an ecclesiastical provision by the state, an example of external voluntaryism, or a willing public contributing of their wealth to the Christian instruction of the common people, through the medium of a willing government. It only differs from a separate or a personal contribution, by the channel of conveyance through which it passes” (100-101). And this is precisely what Chalmers was doing in his Church Extension campaign in the Church of Scotland – fundraising and building new church facilities for the impoverished, unchurched classes in the hopes that such a demonstration of initiative and benevolence would help loose the purse strings of the government to assist. He saw no inconsistency, but only the greatest harmony of principle “between the legal and the voluntary part of our conjunct operation” (106). At the time of the publication of these essays, he cites 180 buildings that had been funded and built through the free-will offerings of donors throughout the land. But lest some should entertain the suspicion, the cause that he advocated was emphatically not a self-serving one. The men of the Church Extension campaign did not seek to line their wallets. Rather, their “sacred object is,” he writes, “the moral well-being of that mighty host who swarm and overspread the ground-floor of the fabric of our commonwealth” (110), who had no money and often no interest for the provisions of the Gospel. And so Chalmers wrote as the man from Macedonia, “Come over … and help us” (Acts 16:9). And so we have the theoretical foundations of religious establishments in the thought of Thomas Chalmers. In the next installment, we will treat the final three lectures on related matters.